Snow at the Front. 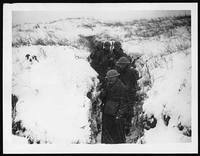 Soldiers leaving Reserve Trench (National Library of Scotland). Free Access – Rights Reserved. One of the most enduring myths of WWI centres on the conviction, widely attributed to the early months of the war, that conflict would all ‘be over by Christmas’ and peace would have resumed. Given the range of intersections between language and history at this time, it is perhaps unsurprising that the Words in War-Time archive can also offer interesting evidence in this respect. The range of forms which appear through the autumn of 1914 present, however, an early corrective for the popular narrative of a short war. Instead, as the archive confirms, WWI generated a range of combinatory forms and constructions in which expectations that a war winter would succeed a summer and autumn of conflict were, in reality, unambiguous.